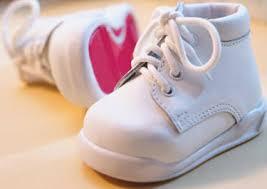 September is Infant Mortality Awareness Month: Give Babies a Healthy Start! Healthy Start Coalitions will join with community partners around the state in September to raise awareness about infant mortality and strategies to improve the health and well-being of babies in the first year of life. Celebrate Day 366 is the theme of the nationwide observance, underscoring the importance of giving every baby a chance to start life healthy. The National Healthy Start Association is leading national campaign activities. In 2017, 1,355 babies died in Florida before reaching their first birthday. 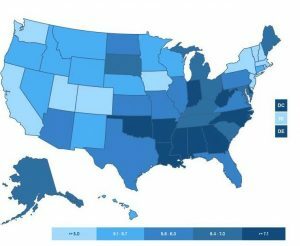 With an infant mortality rate of 6.1 deaths for every 1,000 live births, Florida ranked 29th among states in this key measure of infant health. 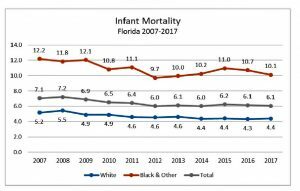 Over the last decade, the state has seen a 14% reduction infant death rates overall – although significant racial disparities persist. The infant mortality rate for babies who are black and other races is 10.1 deaths per 1,000 live births, compared to 4.4 deaths per 1,000 live births for white babies. Between 2001-2017, non-white infant mortality decreased 17% while white infant death rates decreased 15%. The Florida Healthy Start program was created in 1991 to improve birth outcomes and support healthy child development. It included universal risk screening of pregnant women and newborns, care coordination, and wrap-around services including parenting, childbirth education, and smoking cessation. Legislation also expanded Medicaid coverage for uninsured pregnant women and created special clinics for high-risk pregnant women. It also created a network of community-based coalitions to ensure services responded to local needs and were coordinated in a system of care. Since the program’s inception, infant mortality rates have declined significantly from 9.6 deaths per 1,000 live births in 1990 to 6.1 deaths per 1,000 live births in 2017. Healthy Start currently touches more than half of all pregnant women and 40% of newborns in Florida, and has provided direct services to more than 50,000 at-risk pregnant women and 36,000 newborns annually. Local Healthy Start Coalitions lead efforts to develop responsive, community-based systems of care to address the unique needs and resources of their areas. The state invests general revenue and leverages Medicaid waiver funding to support Healthy Start. In response to emerging research, a changing health care environment and a commitment to increasing program impact on persistent challenges such as low birthweight and racial disparities, Healthy Start is focusing on the highest risk families and strengthening its interventions with prevention pathways for depression, interconception care, child development, substance abuse and intimate partner violence. Local Healthy Start Coalitions are serving as a hub for ensuring at-risk families seeking services are connected to local programs through coordinated intake and referral. During September, Healthy Start Coalitions will be organizing awareness events and commemorative celebrations to draw attention to the importance of investing in the best possible start for Florida babies.